Prosper’s controversial report is back to investigate the number of vacant properties flying in the face of the ‘supply crisis’. *** If you are frustrated at the vacant blocks you pass on your commute and would like to be involved in the media campaign, please get in touch. If by chance you are an investor who holds vacant property and would like to discuss the relevant economic incentives in the media, please get in touch via land@prosper.org.au or 9328 4792. The report provides insights on the speculative investment strategies adopted and how they culminate in vacancy outcomes. Further analysis is provided on how the state of the property cycle affects the number of vacancies. 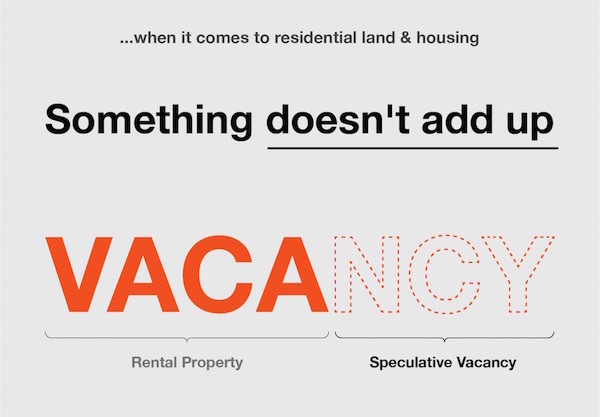 It has been three years since our last Speculative Vacancies report. A lot has changed in that time, with both state and federal vacancy taxes implemented. The paper includes detailed reforms addressing why current vacancy settings do not add up. Join report author Karl Fitzgerald for his first Speculative Vacancies report since the landmark 2007 investigation. Drinks and nibbles will follow the presentation. Seats are limited so book now. I miss the presentation but I really keen to obtain the report, could you please send the report to below email address? I am so appreciated your help! the report can be read here. Watch the presentation and powerpoint here. Hope you can share it around.